My name’s Louise and I’m so happy to be writing for The Thrift today! My blog is Pauper To Princess and is all about ethical fashion, beauty and travel, with a peek into my serious charity shopping addiction. I also do look-books and beauty tutorials over on my YouTube Channel so check it out! As any self-confessed thrifter will know, keeping on top of your clutter (aka beloved pride and joy wardrobe) can be a bottomless task. I’ve tried every trick in the book to declutter, but having recently read The Life Changing Magic of Tidying Up by Marie Kondo, I’m a total convert, if not fully blown minimalist. 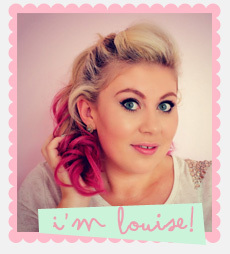 ‘Sprinkle of Glitter’ blogger Louise Pentland tells us why she donates her items to charity shops! Hi, I’m Louise from the YouTube channel and Blog, ‘Sprinkle of Glitter’. I make videos and posts about beauty, fashion, lifestyle and my sweet Daughter, Darcy. I’m so excited to be part of The-Thrift today and talk to you about why I donate items to charity shops!